Travelling home from Gatcombe after a busy weekend. Friday saw us at Great Witchingham with Sparkles and Quinn. We also had Jaya (New Zealand rider based with us ) and Noor doing an intermediate. It was an early start – we left home at 2:30am as it is a bit more than four hours to get there. The cross country track at Great Witchingham was challenging but educational so for the four horses we had from the yard it was well worth the trip. They all came home after having done very well. Saturday was a day of teaching down near Cirencester, at Oxstalls, a relatively new cross country course. It’s always nice to try a new facility and it certainly has a good variety of questions. Sunday came around and the first thing we did was to have a bit of a jumping session with Josh at home before heading down to Gatcombe with Tonto and Alfie. Tonto was doing the open intermediate and Alfie was doing the advanced intermediate. Tonto seems to have really grown up this spring and I’m hoping that it will just continue as it is nice to feel a horse understanding his job a little more. 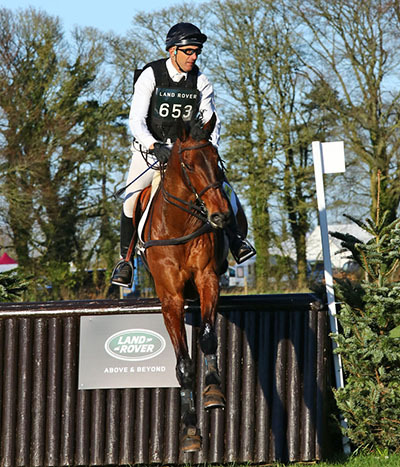 Alfie felt like an old pro and gave me a lovely double clear, finishing fifth.